For the past few months, my NPQ colleague Amy Costello has been working on a series about the problem of sexual harassment and abuse in the global aid sector. 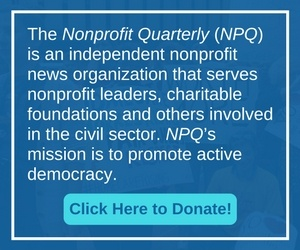 NPQ will be on a publishing break until September 5th, but as we head into a long weekend, we thought we would share some of what’s been happening here behind the scenes. I want to invite you to spend some webinar time with me and the insightful Dr. Patrick Rooney, associate dean of academic affairs and research at the Indiana University Lilly School of Philanthropy. All nonprofits have or should have moments of ethical self-questioning, and it is in the nature of ethical questions to be subject to subjective judgment. NPQ is proud and excited to announce Cyndi Suarez as its new senior editor! This is my favorite nonprofit conference of the year because people actually talk about realities rather than one-size-fits-all prescriptions. Join us! Speaking the Future: If Not You, Who? Some conflict is necessary for our work, but the way we handle the conflict can influence whether people feel respected. As we go through this presidential transition, NPQ has given a lot of hard thought to what we write on and from what stance.